After a nationwide search, the Gerald R. Ford School of Public Policy welcomes Susan Guindi as the new director of Student and Academic Services. Guindi comes to the Ford School after an 18-year tenure at U-M Law. "Susan rose to the top of a very strong applicant pool based on her deep experience in the field of student services, her U-M ties, and her proven ability to build strong staff teams," said Ford School Dean Susan M. Collins. As director of Student and Academic Services, Guindi will provide strategic leadership, direction, and oversight for all academic and student services activities. She will also collaborate with faculty, staff, students, and alumni to promote and enhance the quality of student learning and student engagement at the Ford School. 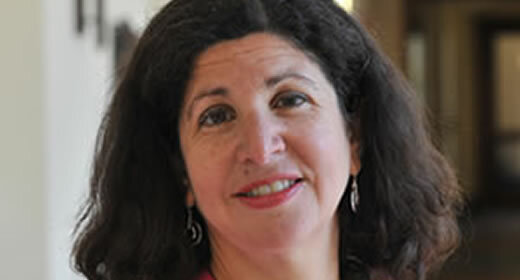 Guindi earned her JD at the Law School and initially worked there building public service career connections for students. Before coming back to U-M, she was an associate at two Washington, DC law firms, and also served as a clerk to Justice Dennis Archer in Detroit. Susan Guindi joins the Ford School community on August 5. Photo courtesy of U-M Law.